This report sets the Committee’s advice on the fourth carbon budget, covering the period 2023-27, as required under Section 4 of the Climate Change Act; the Government will propose draft legislation for the fourth budget in Spring 2011. In line with the required timetable, this report comes only two years after the first report, which recommended budgets for the first three periods. From now on budget advice reports will be delivered every five years. This report joins up the detailed analysis that we have previously published on the path to 2020, with longer-term analysis of the path to 2050. It contains in depth analysis of the latest climate science, the international context and looks across sectors including power, surface transport, buildings, industry and agriculture. Limited numbers of the CCC’s full report were printed. The report was printed using waterless printing, 100% renewable energy and vegetable oil based inks on paper with 100% recycled content, FSC, EMAS and ISO 14001 certified. The exhibits and underlying data used within each chapter of the report is available to download by clicking on the relevant links below. The CCC commissioned research from a number of consultants to inform its advice on the fourth carbon budget. Consultant’s reports are listed below according to the chapter that they support and can be accessed and downloaded by clicking on the relevant link. Chapter 7 – Cranfield University study (2011): “The effect of changes in UK food consumption on land requirements and greenhouse gas emissions” Report revision in April 2011. This document is a revision of this report first published in December 2010. Tables 30 and 31 were changed following scrutiny of the original data relating to UK land use change effects. Errors in the presentation of the data used were identified. The relevant analyses were repeated. Chapter 7 – Opportunities for reducing emissions from agriculture – Scottish Agriculture College, 2010, Review and update of UK marginal abatement cost curves for agriculture. 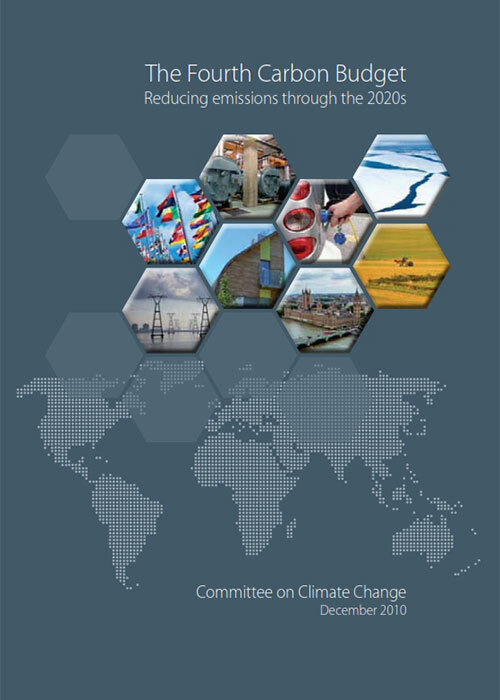 The Committee on Climate Change commissioned AEA to assess the options for decarbonising the industrial sector to 2030 (see link to report below). This work was intended to build on previous work (which looked at the options of low carbon heat and Carbon Capture and Storage) into a wider review of options, including more radical technologies, some of which are not commercially available at present. To supplement this work, we asked Dr Julian Allwood (Cambridge University) to provide a short independent expert review at the draft report stage. Dr Allwood has substantial experience in options for industrial decarbonisation, in particular in the iron and steel sector, which is one of the most highly emitting industrial sectors out to 2030. His letter is attached, alongside a further AEA response. Dr Allwood makes the point that while the technologies and approaches explored in AEA`s project are important to decarbonisation, further decarbonisation could be achieved through material efficiency – using less materials to achieve the same level of utility. We agree that material efficiency could play an important role in industry decarbonisation in future. However, the immediate context of our work was to feed into consideration of the Committee’s advice on the fourth carbon budget (2023 to 2027), required by end-December 2010. Estimation of potential from material efficiency improvement is at preliminary stage. We will come back to this in further work. Dr Allwood underscores the substantial uncertainty surrounding analysis of emissions abatement in the industrial sector. We agree with this. It has been important to recognize this uncertainty in providing fourth budget advice. We have also attempted to illustrate uncertainty quantitatively through sensitivities on costs and scenarios on levels of abatement. The implication of materials efficiency is that it is likely that our industrial abatement scenarios could understate potential to 2030. The degree of further abatement from this source will be an area of further work for the Committee.